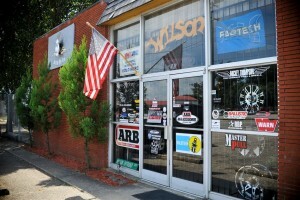 Wilson Off Road, located on 520 East Russell St. in downtown Fayetteville, is the largest off road shop in Cumberland county. We carry it all for everyone and any 4×4, rear wheel drive, or military vehicle on the market. Since being founded in July of 2006, Wilson Off Road has expanded into a 1000 sq. ft. showroom stocked with 4 wheel drive builder parts and accessories. 8 bays with large fabrication area. Complete suspension kits, suspension parts, builder parts, gears, lockers, brakes, lubricants, engines, transmissions, transfer cases, recovery equipment, tire, rims, air conditioning, bumpers, sliders, exo skeletons, seats, gauges, accessories.